Accommodates most of the 35"-65" plasma, LCD/LED TV or not exceeding 150 lbs. 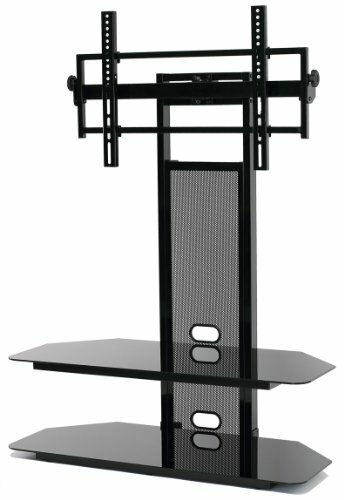 ; Universal flat panel TV mounting system with 12° tilt up or down and 15° swivel left or right ; Constructed with tempered safety glass with bevel edges and heavy gauge powder-coated scratch resistant metal with gloss black finish; Cable management system to hide wires & cables; Holds at least 2 audio video components and a center channel speaker; Contemporary design compliments any room decor; Easy to assemble. Overall Dimensions: 40" W x 19 1/2" D x 56 3/8" H Usable shelves space: Top shelf : 26" W x 17 1/2" D Bottom shelf: 26" W x 17 1/2" D x 10" H Maximum supported mounting interface: 700 mm (W) x 400 mm (H) Weight Capacity: Top shelf: 80 lbs. Bottom shelf: 185 lbs. Accommodates most of the 35"-60" plasma, LCD/LED TV or not exceeding 150 lbs. If you have any questions about this product by TransDeco, contact us by completing and submitting the form below. If you are looking for a specif part number, please include it with your message.